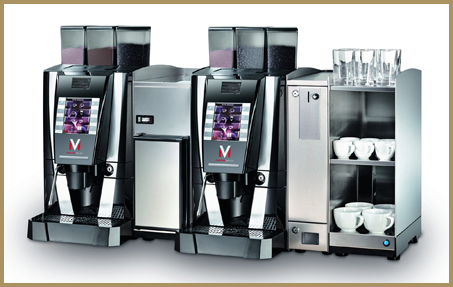 The Macchiavalley Zion is a stylish super automatic bean to cup coffee machine suitable for sites wanting to produce several hundred coffees a day. It also offers a chocolate powder canister allowing it to produce frothy hot chocolate drinks and mocha. The 2 bean hoppers allow customers to use 2 types of coffee bean which in turn may be blended into each type of coffee in any proportion desired. There is also a separate hot water nozzle and steam wand. 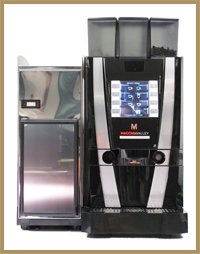 The machine is fully automatic (one touch of a button to obtain a coffee) and is suitable for sites wishing to dispense up to approximately 700 coffees a day. It must be plumbed into the mains water supply and fitted with a commercial water filter. Also available are milk fridges, cup warmers and even payment modules. There is a stainless steel boiler used for the supply of the hot water and coffee as well as an adjustable nozzle allowing for the use of a cup up to 16cm tall. The TFT graphic display allows for easy interaction with the machine. Up to 21 coffee and chocolate drinks can be pre-programmed. We can provide Zion machines and all of the service support for them that you may require across Greater London. We have staff and vehicles operating in the City of London and West End of London every week day and as such can offer a speed of delivery and service back up that are second to none. Our base just outside of Hemel Hempstead means that we can provide excellent cover for your coffee machine in towns and Cities such as St Albans, Welwyn, Slough, High Wycombe, Berkhamsted and Hemel Hempstead.